Thanks to our clients, vendors, and team members—2018 was a great year. Here are some highlights of what we accomplished together! 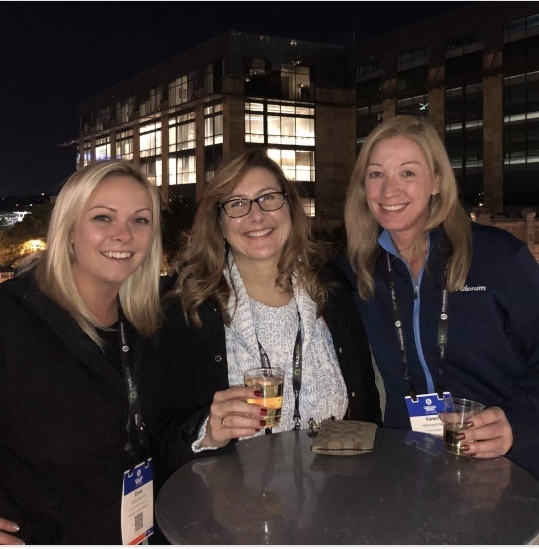 This past November, Jeanette MacDonald (PMA), Erica Crofton (PMA), Clay Backus (Project Manager), and Shawn Albin (Chief Estimator & Project Manager) attended Groundbreak 2018 in Austin, Texas. Groundbreak is hosted by Procore, the project management software used by Crofton’s project management team members since 2016. Procore provides Crofton team members with central location for project documents, document management, workflows, and productivity tracking. Since adding Procore to Crofton’s portfolio of technology systems, we’ve received nothing but positive feedback from clients who take advantage of features like real time productivity reporting. While attending Groundbreak, Shawn, Clay, Erica, and Jeanette attended sessions on project budgeting, leadership, Field Productivity, and collaborated with Procore’s representatives in the Innovation Lab, where they could provide feedback to Procore on what’s working well, what can be improved, and suggest new features! Erica Crofton (left) attends networking reception at Procore Groundbreak. Crofton is currently executing repairs and improvements to the City of Newport News’ Seafood Industrial Park. The industrial facility brings in about half of the seafood that lands in the Port of Hampton Roads and these improvements are part of an effort to return the park to 100% capacity. Improvements include increasing the capacity of the travel slip, which will support Fairlead’s new travel lift, and adding 4 new 100-ton mooring bollards. Additionally, Crofton will make miscellaneous repairs to the existing concrete bulkhead. 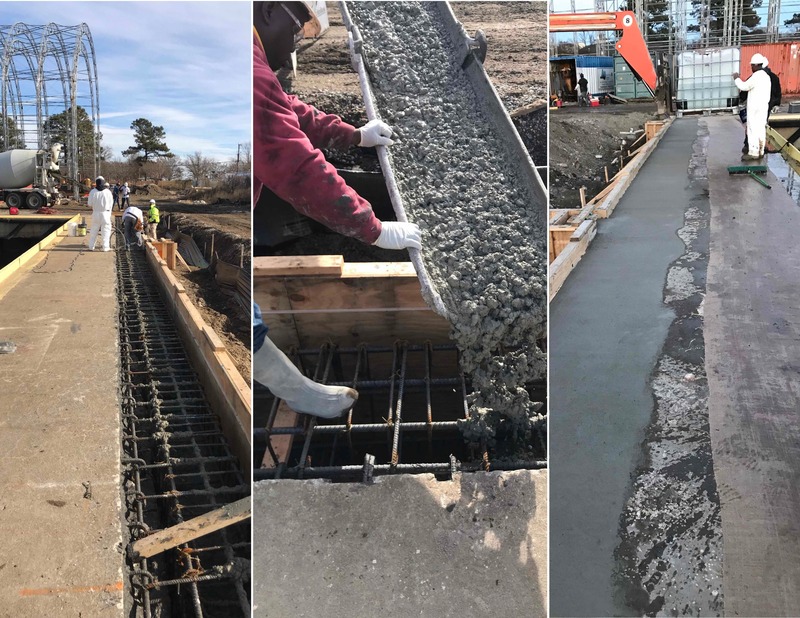 For the travel slip, 20 new HP piles were driven, and new cast-in-place concrete cap was poured. The new mooring bollards are 19’ tall x 4’ thick x 9’ wide and are supported by 8 14×89 H piles. “We always enjoy an opportunity to work with the City of Newport News. They’ve got a great team of professionals.”, shared Shawn Albin, Chief Estimator & Project Manager. This phase of improvements is scheduled to be completed by the end of April. Thanks to Trenier King (Foreman), Isaac Hernandez (Carpenter), and crew for their efforts on this project! See 13 News’ coverage here. 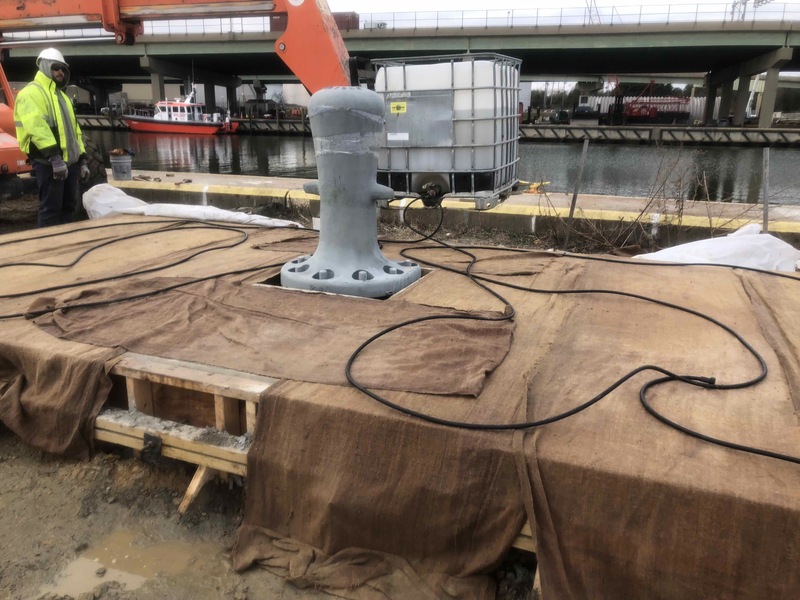 Crofton Diving recently served as a subcontractor repairing a steel sheet pile bulkhead at an industrial plant located on a commercial waterway. The total length of the bulkhead was 926 feet and the waterline levels ranged from 4 to 14 feet. The original bulkhead construction consisted of PZ-35 or Frodingham 4N steel sheet piles. 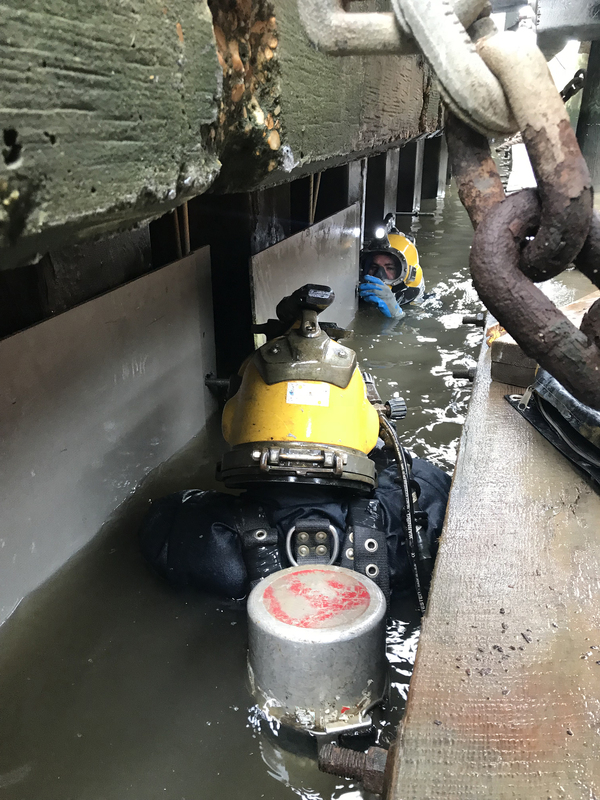 Lewis Myers (Superintendent) and crew began their efforts with an underwater investigation to identify any obstructions that would prevent the new sheet pile repair system from being installed. 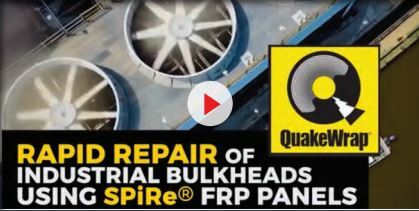 The existing sheet pile bulkhead would be repaired using the SPiRe® system, which consists of engineered panels made with fiber reinforced products (FRP). This stay-in-place chemical resistant system will protect the commercial waterway from chemical leaks from the industrial plant’s containment area or retention pond. A sample system was constructed and tested at the QuakeWrap Inc. headquarters first, and again at Crofton’s facility in Portsmouth to calculate productivity rates and to be sure that it met specifications. David Mrowiec, P.E., principal engineer shared that “as a result of the field mock ups, we were able to collaborate with our client to develop an innovative custom diver tooling which increased production by about 150 feet while maintaining a high level of safety.” Read full article in PileBuck Magazine here. Watch this video to learn more about the SPiRe system. At Crofton, we know we must be diligent about keeping safety at the forefront of creative problem solving. The most important thing is that everyone goes home to their families safely at the end of the work day! On November 13th, Crofton held a workshop for managers and superintendents where team members reviewed case studies of safety hazards, discussed the potential ramifications of each, and ways to resolve them or prevent them from happening in the first place! Thanks to everyone who participated and engaged in the conversation.